- Model is 5'9.5 (177 CM). She is wearing a standard WD4 (hollow to hem 61''). 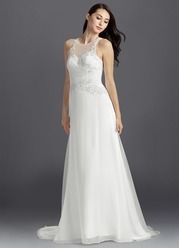 Gwendolyn is an a-line beauty with a lace halter and beading accents at both the neckline and waist. Not to mention its elegant and beautifully understated delicate lace straps at the back. Available in full size range (WD0-WD30) and in custom sizing. Absolutely love this dress. It is so simple, which matches my style completely. 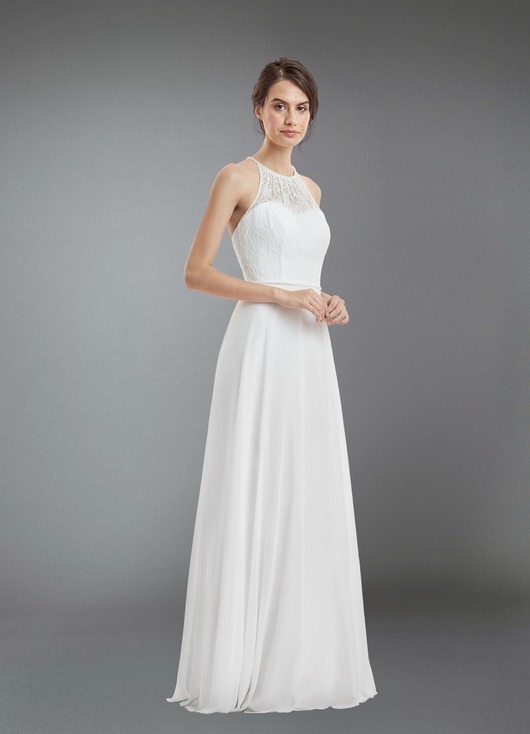 It has nice beading around the neck line and around the waist which adds a little more detail to the otherwise simple look. I liked how light it felt, but was not see-through. 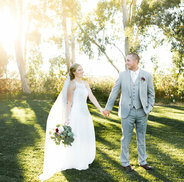 I wore it as my wedding dress and was not disappointed! I was so excited to get this dress for try-at-home. I am 6’1 so as expected the sample was a little short (barely hit the floor when barefoot) and a I am a classic size 10. The dress itself fit perfectly and is true to size. 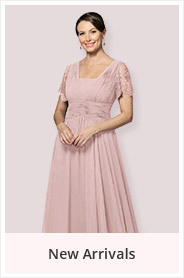 Sadly the neckline was a bit lower than expected and I will not be picking this for my wedding. 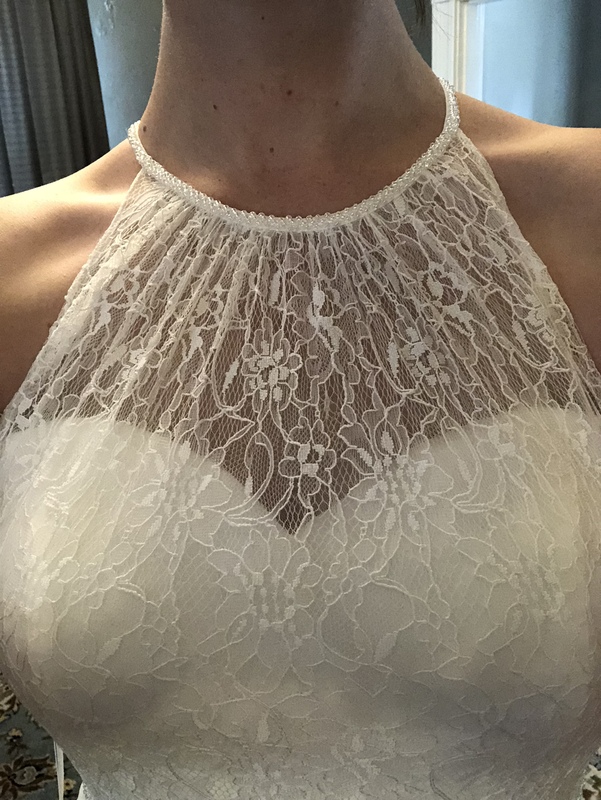 My bust is 36DD and I don’t think the halter style is best for my body even though I loved this dress. There is nice beading on the halter which the pictures don’t show on the site. This is a great dress! I thought the beaded neckline might be annoying, but it felt fine to wear. I ended up loving the way I looked in this dress. It's not my style, so I ended up choosing against it, but it definitely tempted me! My measurements were between 2 sizes, so I went with the larger. The measurements felt mostly true to size, but I think I would round down a size rather than up. I loved this dress! 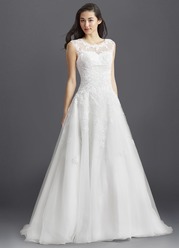 I tried it on as part of the sample program, and it is definitely one of the top contenders for my wedding dress. 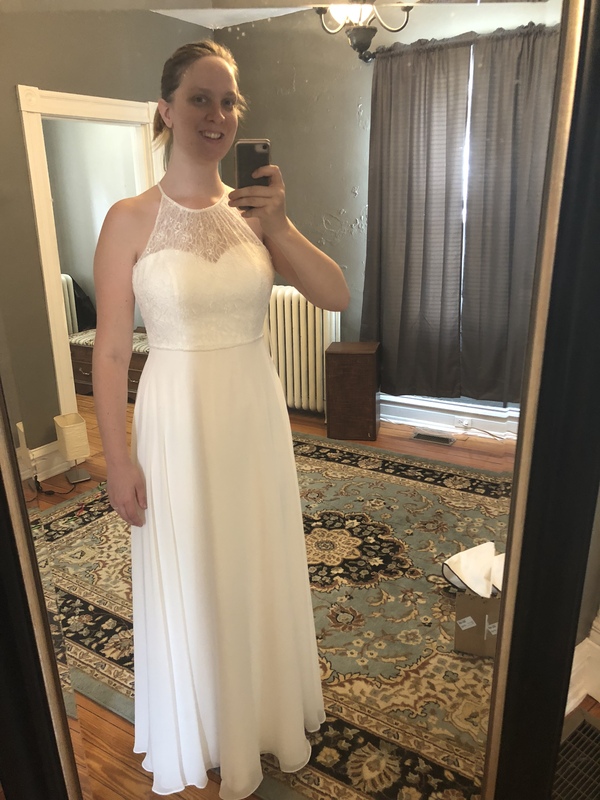 I was impressed with the quality and if i go with this dress it will only need slight alterations (unless I try out the custom sizing). Overall very happy with my Azazie experience so far! 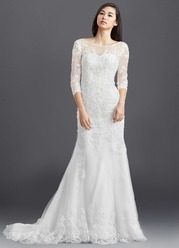 It's a very simple dress, but the beading and lace make it look so beautiful. 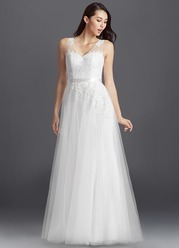 If it would have fit me better, I think I would have loved this dress more but the bust area was very large although it matched my measurements. 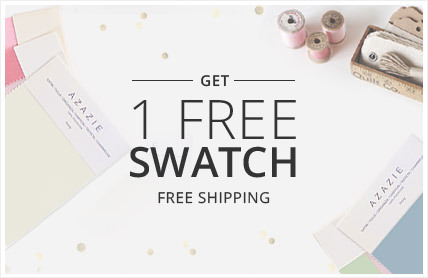 That's the one thing that scares me about custom ordering my dress. Overall, this dress was very beautiful and lightweight. This was a try on. I wear a size 2. The cup size would have needed to be adjusted for me since I'm a cup size A. I used clips to adjust it temporarily. Overall the dress is beautiful. 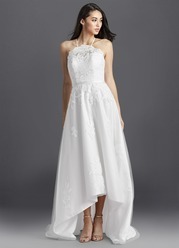 I found the dress to be a bit simple, though. 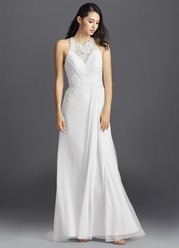 This dress is one of my top choices. Seems to run a bit large and long. I just received my dress and loved it so much! 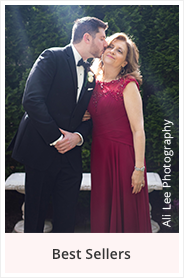 They fit right, will definitely wear it at my wedding, my friends and family also loved it! 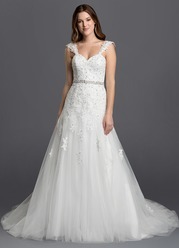 the descriptions for the sizes are correct so measure yourself carefully when you order the dress. I also enjoyed the customer service and how helpful everyone was to me! Love love love this dress! Beautiful, great detail, the back is stunning! 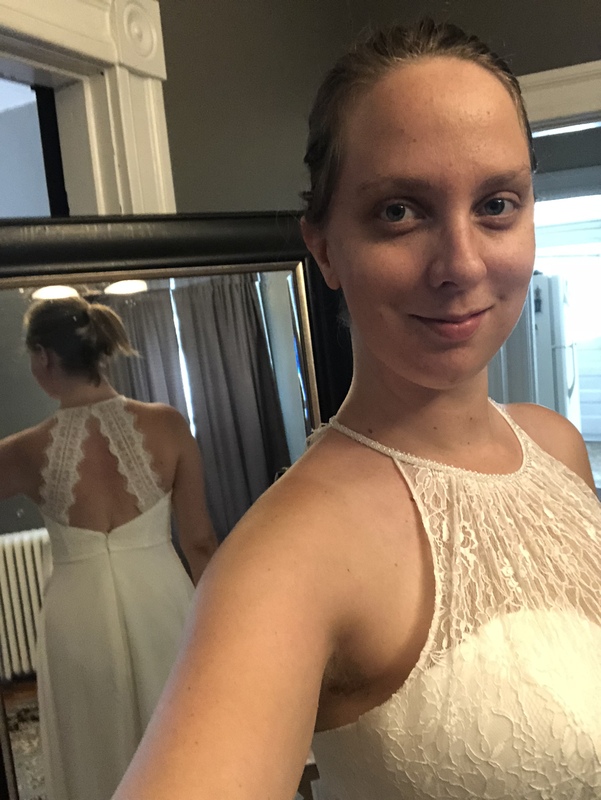 Tried on a sample and ordered as my wedding dress!